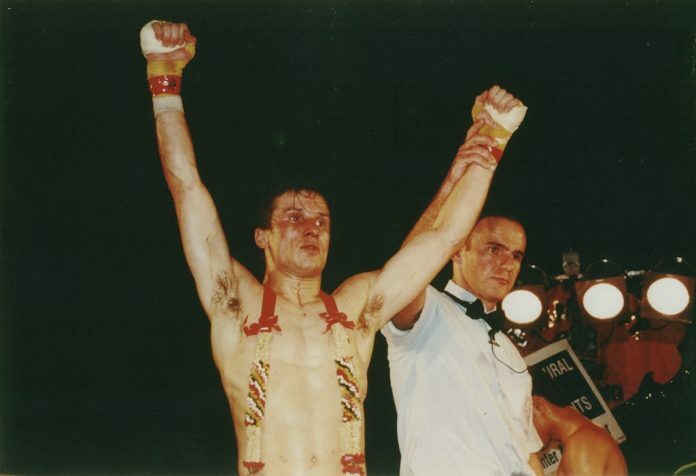 I used to be a Muay Thai fighter out of the Kao Sok Muay Thai Gym in Perth, Western Australia, trained by Darren Curovic. I had to do an ACL repair operation which kinda put a stop to that. I think I first did it in the grapple against a fighter called Dave Hoy. It hurt but I saw the fight out to the end. Maybe it was only a strain but I didn’t get it checked out. Later I completely snapped it during a shootboxing fight in Japan. Worst pain I had ever felt in my life. I wanted someone to just shoot me and put me out my misery right there! I saw the stretcher coming but there was no amount of pain that would allow me to be stretched out of there. I got up and limped out. …although I love nothing more than still going to training and having a good spar! This particular photo was of my win against Australian legend Chris White. I remember I was shitting myself before the fight – I was about to go up against Chris White! I was pacing around ring, watching the earlier fights, trying to get rid of the nervous energy. I had always been a fairly strong grappler, so our game plan was to try and grind Chris down in the grapple and not allow him to use his great technical skills to beat me up. It worked, and in the 4th round I was able to send a right cross to end the fight with a KO. It was a gruelling fight with Chris managing to break my ribs with his kicks…and let me tell you, not the nicest thing when you’re trying to lay down to sleep or get back into training again.